Motorola MBP36S Remote Wireless Video Baby Monitor is one of the best baby monitors that made it into the Top Baby Monitor 2015 list. This wireless baby monitor is worth every penny because it offers impressive features including a superb video and audio quality. The MBP36S is the successor of Motorola’s previous version, MBP36. That being said, it’s guaranteed to be better than its predecessor because it is expected to arrive with improved features. Check out how MBP36S performs in terms of video and audio quality. The Motorola MBP36S offers one of the highest video qualities you’ll find in video baby monitors. With an LCD screen, the Motorola MBP36S boasts of the image and video quality that has been enhanced with modern technology to enable it to produce excellent video quality at daytime, or even at night with its night vision feature. The night vision feature is also of excellent quality. It allows you to see every detail in your baby’s bedroom that you want or need to see, which will surely give you peace of mind. With its superb quality image, you can literally watch your child in the dreamland. This 3.5-inch digital wireless baby monitor also features a highly sensitive microphone that produces clear audio, a sound-level indicator, and 2-way communication. These features leave parents with nothing to worry about as their young ones wander off into dreamland. One of the most superior features of MBP36S baby monitor with camera is its remote pan, tilt and zoom camera features. These features allow you to move the camera in different directions or angles to allow you to monitor your child’s surroundings. This security feature is only available to a few video baby monitors on the market and Motorola MBP36S offers it. The revolutionary Picture-in-Picture feature allows you to keep an eye on several areas of the room or more than one room, keeping you updated with more views than ever. The additional cameras allow parents to keep a close eye on up to 4 rooms in their home. Most baby monitors do not offer this revolutionary feature, but MBP36S does. Featuring a 2.4GHz FHSS Technology, the Motorola MBP36S Video Baby Monitor offers wireless connection in superior reliability promoting a better range and stronger signal. This feature also enables the impressive 2-way communication function that allows parents to sing to their babies, or reassure them when they wake up in the middle of the night without getting out of their bed. The MBP36S comes with 5 polyphonic lullabies to soothe your child when she wakes up in the middle of the night. It also comes with a temperature display to allow you to monitor the temperature of your child’s room. Aside from these features, it also comes with low battery alerts to inform you that you need to charge the device. It is also equipped with an alarm system that will call your attention when you are getting out of range of the transmitting unit. In this way, you will never have to wonder if you are close enough or too far to hear what’s going on in your baby’s room. The Motorola MBP36S Video Baby Monitor’s features have all been designed to produce a convenient device that every parent would love. 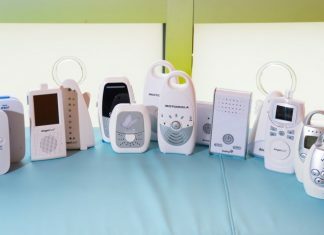 Low battery alerts, LED lights that activate when the baby cries, infrared night vision, room temperature monitor and 5 polyphonic lullabies all spell convenience and efficiency for parents who have nothing but safety in mind. There were many complaints about the MBP36, as we’ve seen with the baby monitor reviews, but MBP36Sis designed to redeem Motorola’s baby monitors. Motorola MBP36S has everything parents need from a device to monitor the safety of their children. The Motorola MBP36S Video Baby Monitor has been receiving positive reviews from satisfied parents across the US. The majority of the reviewers say they would recommend the product to other parents because they find the features incredibly amazing and useful. Kghmom0808 of Nashville, Tennessee swears that she could see her baby’s stomach and chest move up and down as she breathes using this baby monitor. Meanwhile, BlueCC of North Carolina was initially worried about the complexity of the Motorola MBP36S Video Baby Monitor. However, when the item arrived, she realized that her fears were baseless. In fact, she was impressed with the clarity of its microphone and night vision. David R. appreciates the instant setup feature, along with the excellent picture quality. They also find the remote camera controls (pan/tilt/zoom) to be extremely useful because their child tends to move a lot at night. With an overall rating of 4.7, the Motorola MBP36S Video Baby Monitor is among the top performing baby video monitors in the market today. It has a growing network of satisfied customers and comes with impressive features, making it one of the popular choices among modern day parents and families worldwide.